What the Gov: What Do The Mayoral Candidates Have to Say About The Environment? Here's how Toni Preckwinkle and Lori Lightfoot's platforms compare on key environmental issues in Chicago, plus what activists want to see from the new mayor. This article is part of a series called What the Gov, where BGA Engagement Editor Mia Sato takes reader questions and tracks down the answers. This story was inspired by What the Gov reader Christiane Rey. In the (many, many) months since the mayoral race began, candidates have had to answer to a range of issues Chicago faces, and how they would go about solving them. What will they do about crime and violence? How about funding public schools? But several What the Gov readers noted the lack of discussion on environmental issues, and though there’s been a push to get candidates talking about lead in Chicago’s drinking water, that’s often where the conversation begins and ends. So what do Lori Lightfoot and Toni Preckwinkle have in mind for a greener Chicago? In terms of environmental platforms, Preckwinkle and Lightfoot call for many of the same measures: reinstating the Department of Environment, transitioning the city to clean energy by 2035, overhauling the city recycling program and — of course — replacing the rampant lead service lines, among other issues. It’s one thing to be able to list platitudes about building a cleaner, greener Chicago. But it’s another to be able to back it up with specifics policy proposals and pledges. Both candidates — along with several aldermen — are in favor of bringing back the Department of Environment, the enforcement agency that outgoing Mayor Rahm Emanuel shut down in an effort to save money. BGA reporting showed that since Emanuel took office, city actions to crack down on polluters plummeted. Preckwinkle said the revived department will be in her first city budget if elected mayor. Lightfoot’s campaign said the city’s responsibility to protect residents from environmental harm starts with a new Department of Environment. The campaign didn’t respond to questions about including it in the first budget. One topic most immediately visible to voters is recycling. A BGA investigation last year revealed that Chicago’s residential recycling rate is just nine percent, by far the lowest of any major metropolitan area in the country. In the wake of the investigation, the Emanuel administration promised to reform the program. Preckwinkle says she would start with a performance audit of the recycling haulers — something Emanuel promised years ago but never happened. Lightfoot’s platform promises a “transparent, proactive approach” to incentivizing recycling success, and says the city will have the opportunity to address the issue when recycling haulers’ contracts come up for renewal this year. The campaign didn’t respond to requests for specifics about how it would use the contracts to improve the system. Even the most talked-about environmental issue, Chicago’s lead service lines, suffers from a lack of details — namely, how the city would pay for replacing the lines. The estimated cost to replace lead service lines is $1.4 billion to $2.5 billion, and though Preckwinkle and Lightfoot both say they support using city money to fix the problem, neither platform crunches the numbers and past City Council attempts to come up with the money have stalled. Some ideas that have been floated include going after federal and state funding and providing incentives to homeowners to replace lines themselves, but neither candidate has shown they’ve done the math. Chicago has long been a hotbed of the environmental justice movement, so it makes sense that both Preckwinkle and Lightfoot list it as a core component of their platforms. The federal government marks areas as “environmental justice” communities to draw attention to the fact that different areas experience different levels of pollution. In Chicago, black and Latino communities in Little Village, Pilsen and the far Southeast Side experience the greatest toxic threat. Last summer, local activists fought the city as it approved the moving of a scrap metal plant to the Southeast Side from the affluent Lincoln Park, where residents complained it was polluting the air. Andrew Daglas, communications lead for the Chicago chapter of the Sierra Club — which has endorsed Preckwinkle for mayor — said the group is looking to a new administration for a focus on environmental justice in city policies. Daglas said the Chicago chapter hopes the new administration will commit to righting the wrongs that have forced some residents to disproportionately shoulder the burden of toxic threats. Preckwinkle said the reinstated environmental department would be tasked with identifying areas with environmental justice concerns and going into the communities to discuss solutions. Lightfoot’s proposal says the city must require industrial developments to complete an environmental justice analysis that lays out potential hazards, impact on pollution in the area and steps required to minimize or mitigate hazards. “Not only enforcement needs to be stepped up, but [so does] a genuine, holistic approach to treating regions, investing more, to developing fairly and equitably in ways that respect everyone’s health and that don’t continue the legacies of discriminatory treatment that has happened in the past,” Daglas said. Though both Lightfoot and Preckwinkle acknowledge that minority and low income communities often bear the brunt of environmental hazards, neither elaborated on how exactly they would use research showing these disparities to inform development. And residents in environmental justice areas have reason to be skeptical. In the past, even after city officials promised residents environmentally and community-friendly developments, potentially harmful industries were proposed. Environmental activists say that the lack of progress on green issues at the federal level is putting the pressure on state and local governments to step up. “The Sierra Club nationally has been looking to a lot of state and local leadership to pick up the slack in terms of environmental policy and environmental enforcement, considering what’s going on at the federal level,” Daglas said. Kizaire said she didn’t see the Emanuel administration make environmental justice a priority, even as Emanuel played up his green credentials and attacked state and federal officials for rolling back environmental protections. Both candidates’ environmental platforms largely align with environmental groups like the Sierra Club, with items like transitioning all municipal buildings to 100 percent renewable energy by 2025, and bringing renewable energy citywide by 2035. But activists like Daglas warn against Band-Aid solutions that fail to account for competing interests at City Hall — especially when green solutions are often pitted against economics, development and employment. 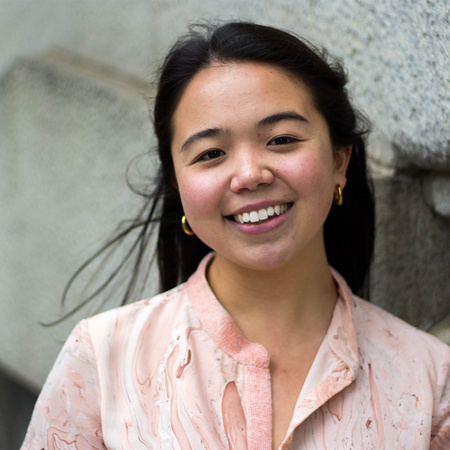 Mia Sato joined the Better Government Association in September 2017 as engagement editor. She graduated from the University of Wisconsin-Madison School of Journalism and Mass Communication with an emphasis in reporting and a double major in political science. What The Gov: Why Is She Called 'Alderman'? The term “alderman” is used for all Chicago City Council members, regardless of gender. Some incoming aldermen say it’s time to update the title. Though there aren't any citywide measures, voters in some wards and precincts will weigh in on rent control, marijuana funds and more. What the Gov: What Should I Know About the Proposed Public Bank of Chicago? A proposal for a public bank has voters scratching their heads. Chicago is one of dozens of cities and states that are exploring or discussing similar proposals.